As you enter the chalet, you are greeted by a spacious lounge, with a roaring log fire and huge comfy sofas. This opens out to the dining area, and essential tea & cake island. For those wishing to spend the evening in the chalet, there is plenty of entertainment available from the chalets Media Centre offering a Wii, NetFlix, and wireless internet access. Take your pick from one of the cosy and stylish ensuite bedrooms, some with balconies offering stunning views. All the bedrooms offer ample storage space with large fitted wardrobes. The bedrooms all offer double or twin beds with the option of fitting in cots or smaller beds for young ones in some of the rooms. Sumptuous cushions and throws add extra luxury & comfort to the rooms, so much so you may be tempted to spend a relaxing day in your luxury chalet in Morzine, rather than on the mountains. 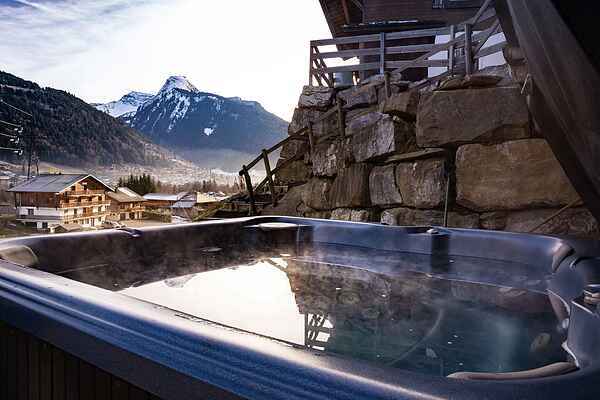 To aid in your relaxation at the end of a hard day on the mountain the luxury chalet in Morzine also benefits from having a sauna on the lower floor and a hot-tub offering breathtaking views over the surrounding area.